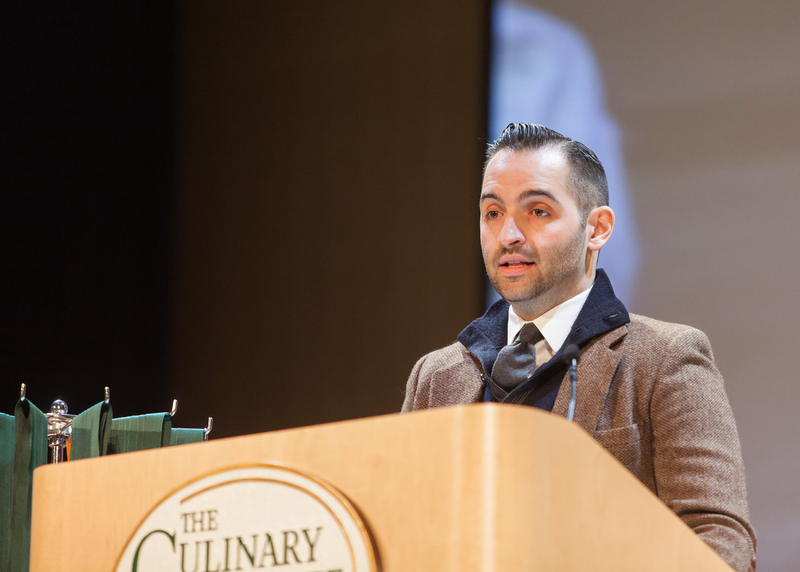 Hyde Park, NY – Celebrated young New York City restaurateur Mario Carbone returned to The Culinary Institute of America (CIA) to deliver the keynote address during commencement ceremonies at his alma mater on Friday, April 11. Carbone's epynomous restaurant in Greenwich Village is a finalist for the 2014 James Beard Foundation Award for Best New Restaurant. The 2000 alumnus told 91 new fellow CIA graduates that their years of studying at the world's premier culinary college are just like a tree's roots, creating the foundation that will grow into the successful careers that everyone will see. "Take this incredible education, plant it, and let it grow roots," said Chef Carbone, owner and partner, with Rich Torrisi '00 and Jeff Zalaznick, of New York City's five-restaurant Major Food Group. "It's not important what you become, but that you do everything in your power to be great at whatever it is." Carbone and one of the Major Food Group's other restaurants, ZZ's Clam Bar, made the 2013 Zagat Survey list of the hottest tables of the year. Another of the group's concepts, Torrisi Italian Specialties, was New York magazine's #1 Italian Restaurant for 2011. Its other restaurants are Parm and Parm Yankee Stadium, and two more are in the works. Mario Carbone, 33, was a nominee for the Beard Award for Best Chef in America in 2011. He and former CIA classmate Torrisi were, as a team, named among Food & Wine magazine's Best New Chefs in 2012 and were twice semi-finalists for the Beard Award for Best Chef: New York City. We'll find out if Carbone is the Best New Restaurant in the United States on May 5, when this year's Beard Award winners are announced.